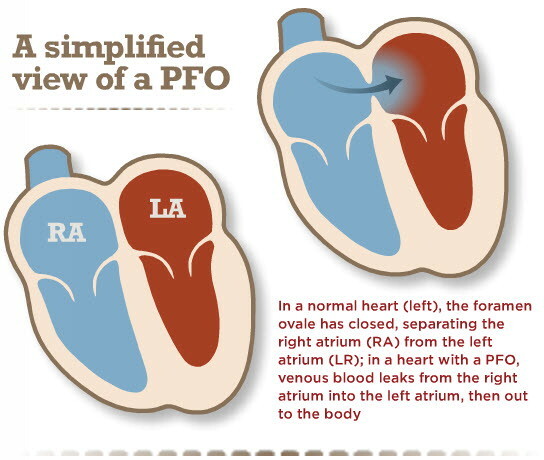 PFO stands for Patent Foramen Ovale. A simple way to think of PFO’s is as a hole in the main interior walls of the heart. In the image below, you can see where the hole forms a connection between the left and right atrium, aka the upper chambers of the heart. It is a very common heart condition, affecting a quarter of the population. Before birth, in developing babies, this connection is important. Why? In the womb, babies don’t breath air to get oxygen in to their blood. Instead they take oxygen rich blood from their mothers. This blood is delivered to the right side of the heart, but it needs to get to the left side so it can be delivered to the body. It gets to the left side through the PFO. 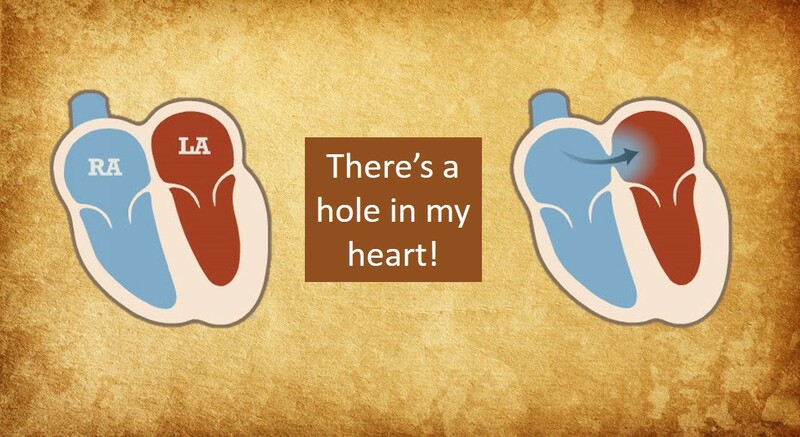 The hole is called a foramen ovale. After birth the baby begins to breath and no longer needs this hole. In most people this closes and seals shut. In 1 in 4 people however it stays open and is called a patent foramen ovale, or PFO. How Do We Diagnose a PFO? PFO’s are typically diagnosed by ultrasound scans of the heart (echocardiograms) performed as part of a work up looking for suspected heart disease. The most common initial test when looking for a PFO is an ultrasound scan known as a transthoracic echocardiogram (TTE). As part of this test, micro-bubbles are injected into the blood through an IV. The scan is then inspected to see whether these bubbles pass from the upper right to the left side of the heart. If they do, it suggests communication between the chambers, such as a PFO. Often patients will be instructed to cough during the test to increase right-sided heart pressure to facilitate passage of bubbles through the PFO, this increases the chance of diagnosing a PFO. The echocardiogram is also useful in picking up structures in the heart that are thought to confer a slightly higher risk of complications in a PFO. A more invasive way of diagnosing a PFO is a transesophageal echocardiogram (TEE), which is an ultrasound scan performed via the use of an ultrasound probe that is passed in to the food pipe where is it close to the heart. The pictures of heart structures seen in a TEE are generally much clearer than in a TTE and so the diagnosis of a PFO can be made with greater accuracy. Because of its less-invasive nature a TTE is the initial step in diagnosis. If closure of the PFO is planned, or if greater detail of associated structured is required, then a TEE may be performed. Is A Hole in the Heart as Serious as it Sounds? The vast majority of people with a PFO are healthy and will remain healthy with no problems attributed to the PFO. In fact most people will never need to know about it, and don’t need to know about it. Over the years however there has been some reported associations of PFO with conditions such as stroke and migraine. I will discuss these in a little more detail below. Rarely the PFO can be made an issue by the presence of other conditions such as critical illness, chronic lung disease, obstructive sleep apnea, or right-sided heart failure. In these cases, the increased pressures on the right side of the heart may potentially cause increased amounts of blood to travel through the PFO to the left side of the heart. This means non-oxygenated blood from the right side will mix with the oxygenated blood from the left side and lead to generally lower oxygen levels, causing shortness of breath. This is a process called shunting and desaturation. In some cases of significant shunting it may be recommended that the PFO be closed. These situations are relatively rare however. Is There a Link to Migraines? Some researchers have suggested a relationship between the presence of a PFO and occurrence of migraine headaches. One of the suggested reasons is that substances in the blood that are normally filtered out on the right side of the heart and the lungs, are able to get to the left side of the heart and therefore to the brain, through the PFO. There is no definitive proof of this however, and it remains a theory without scientific basis. Whether closing the PFO makes this better remains an ongoing debate. Some studies suggested that closure of the PFO might lead to resolution of the migraines and improvement in symptoms in a significant proportion of people. A study that was specifically performed to investigate the effect of PFO closure on migraines demonstrated no significant correlation between closure of the PFO and headaches. However, there are some concerns with the trial design. There are 2 further ongoing trials looking at whether PFO closure can be effective as a migraine treatment. Hopefully these trials will help to give us a clear answer. For now, there appears to be no good evidence to suggest PFO closure in those with migraines. Lets see what the ongoing trials show. Does a Hole in the Heart Cause Strokes? Around 800,000 people a year in the US have a stroke, and of those, almost 200,000 are repeat strokes. Up to 40% of these strokes do not have a clear cause, and these are known as cryptogenic strokes. So what does PFO have to do with strokes? A PFO allows blood to go from the right side of the heart to the left. In addition to blood, stroke-causing materials such as clots, gas bubbles, or other particles can travel through the PFO and potentially to the brain, causing a stroke. For this reason there has been much interest in the role of PFO closure and stroke, or recurrent stroke prevention. Over the years, several studies have suggested a higher incidence of cryptogenic stroke in patients with PFO. This would suggest that in people that don’t have an otherwise identifiable cause for their stroke, a PFO might be related. The problem is, despite the good circumstantial evidence linking PFO to cryptogenic stroke, studies designed to specifically look at this have not demonstrated a concrete association. The big question is, in those patients who have had a cryptogenic stroke, and who have a PFO, should the PFO be closed. I talk about this in more detail below. The PFO is like a tunnel between the upper right and left chambers of the heart. Over the years, researchers have suggested a number of features of a PFO that may be associated with a higher risk of neurological events such as stroke. These features include, a long PFO tunnel, a very mobile floppy tunnel (known as atrial septal aneurysm), and the presence of strands that persist from fetal development (known as Chiari strands). Although several studies have suggested that the presence of these features may confer a higher risk of stroke, these are not definitive and do not clearly suggest a need for closure. Further studies are needed before conclusions can be reached. Most people with a PFO will never need anything doing about it, and can consider themselves to have something that is relatively common and that wont ever bother them. There are some cases where closure is recommended such as occupational hazards (see below for deep sea divers), and in those patients where the PFO is causing oxygen levels to be low. The more debatable indication to close a PFO is in those patients who have had a cryptogenic stroke. This is discussed in more detail below. Should Patients With A Stroke Have Their PFO Closed? Even though the incidence of PFO is higher in those with cryptogenic stroke, the occurrence of stroke is still very low in those with a PFO. Due to this fact specialists are undecided on whether PFO’s should be closed in stroke patients. What is clear is that when someone has a stroke they should be investigated aggressively to look for underlying causes. If a cause is found then that should be treated aggressively. If appropriate investigations are performed and no cause found then it’s by definition a cryptogenic stroke. In those with a cryptogenic stroke, the argument is that since a PFO is present, that may be a cause and so it should be closed to prevent a potentially devastating repeat stroke. The argument against this is that there is no guarantee at all that closing the PFO will prevent a repeat stroke, and since it is still a heart procedure with some underlying risk, (albeit low), it shouldn’t be closed. Until recently, closure of PFO’s was performed very commonly, particularly in patients that had a cryptogenic stroke. Older studies suggested that the recurrence of stroke was lower in stroke patients that had their PFO closed. The problem with these studies were that they were not well-designed studies that were performed to specifically address the question. Basically there were still many unanswered questions. In recent years however, a number of relatively well-designed studies were performed to see if PFO closure, in patients that had a cryptogenic stroke, would reduce the occurrence of repeat stroke. These trials demonstrated that closure of PFO’s was not proven to reduce the risk of recurrent stroke. Those that didn’t believe in closure of PFO’s now had evidence to suggest that in the majority of stroke patients, the PFO should not be closed and this had been proven in specifically designed trials. Those that strongly believed in PFO closure felt that the trials were flawed in that there were not enough patients to draw definitive conclusions given the relatively low incidence of events. There were also issues with the fact that different devices were used in the different trials. So what did we learn for sure? 1) The incidence of recurrent stroke in patients who have had a stroke is still relatively low despite the presence of a PFO. 2) The main focus should be on aggressive treatment for risk factors of stroke with appropriate medical therapy, before any consideration of a procedure for PFO closure. 3) The trials designed to look at whether a PFO should be closed in stroke patients did not demonstrate a benefit of using a device to close the PFO. What Do the PFO Guidelines Say? Guidelines are not perfect, but rather they try to make recommendations based upon the latest evidence available and the highest quality of evidence available. Given the results of the recent trials, the guideline committee assigned a Class III, no benefit recommendation for device closures of PFO’s. Essentially this means they don’t recommend that PFO’s be closed, even in patients who have had a stroke. This was not received well by proponents of PFO closure, as they felt a class IIb and not a class III recommendation should be applied given that uncertainties remained. A class IIb would have essentially meant that treatment may have some benefit but the possibility of neutrality has not been excluded. Most specialists are agreed on the fact that there is a group of patients that will benefit from PFO closure. It’s just that we don’t yet know who that group are. Further trials will be required to clarify these issues, but it’s unknown whether these will ever be performed. What Do I Tell Patients Sent To Me For PFO Closure? The latest guidelines have now come out and basically not recommended that PFO’s be closed routinely, even in the setting of stroke. Despite that, I have patients sent to me regularly for PFO closure. There are several reasons for that. Guidelines are not the law of the land, although they are there in the best interests of patients for the mainstay. Specialists and physicians may not entirely agree which may often be reasonable, but also it is a fact that each case needs to be dealt with individually. For example I may be sent a patient by a neurologist who has a patient that has had a large debilitating stroke. Investigations demonstrated no clear cause and no other obvious risk factors. There is a presence of a PFO with possible high-risk features (such as features of the PFO, or a clot in the veins). The specialist feels strongly that the PFO should be closed based on these and other reasons. The best approach is to have an open discussion with patients. This includes information about the procedure itself. In the right hands, the procedure can be done safely, with minimal discomfort, and the patient sent home the next day. Although complications are possible with any procedure, the rate of complications with a correctly placed device is very low. Although many patients have discussed the suitability of the procedure with their specialists who feel they will benefit, it’s important to discuss the fact that the trials performed demonstrated that in the majority of such patients, there was no clear benefit seen from PFO closure. It’s also important that prior to consideration of device closure that a thorough work up for underlying causes of stroke has been performed. I personally value the opinion and involvement of a neurologist. It is very rare nowadays that anyone would need surgery to close a PFO. PFO’s are closed percutaneously, whereby a small tube is inserted in to a vein in the leg and passed up to the heart. A closure device is then passed up to the heart through this tube across the PFO, and then the device is seated across the hole and secured in position. Ultrasound imaging is typically used to confirm device positioning. The procedure is virtually painless and done under moderate sedation. In experienced hands the procedure takes between 30 minutes to an hour. As far as heart procedures go PFO closure is amongst the safer. As with any procedure there is a chance of complications. The chance of serious complication (device dislodgment, infection, damage to vessels etc.) is less than 1%. Scuba diving is popular and relatively safe, however some divers are known to suffer from a phenomenon known as decompression sickness. This is where nitrogen bubbles form in the tissues during the ascent process. These bubbles can potentially cause local damage or find their way in to the vein blood stream. It is possible in those with a PFO the bubbles can travel through the PFO from the venous right system to the left sided arterial system that supplies the body with blood. Once bubbles are in the arterial system they can potentially travel to the brain or tissues causing neurologic symptoms such as stroke or breathing difficulty. Small amounts of bubbles in the veins are common after diving, the amounts are usually small, and cause no symptoms. Uncommonly, there may be a high bubble load that can be associated with symptoms either from the bubbles travelling to the lung, or through bubbles traveling through the PFO with associated symptoms, such as seen in decompression sickness. So what’s the current consensus regarding diving and PFO? PFO’s are common and in general it’s not recommended that all divers be screened for this. Divers at work in particular should have appropriate prior medical examination. In general it would appear reasonable to screen those who have symptoms, particularly when diving, for a PFO, particularly those with neurologic symptoms. Although closure of the PFO may prevent shunting of bubbles and has been reported to improve symptoms in cases, there is no strong evidence and consensus opinion on the best course of action in this setting. In those with significant symptoms determined to have a PFO, consultation with a cardiologist, ideally in some way familiar with diving practices should be sought, then discussion can take place regarding management and suitability/appropriateness of closure. Can a PFO develop later in life? For example, could a heart attack cause a PFO to form? No, its a defect present from birth, a heart attack is not associated with a PFO, although increased pressures from heart failure can make any flow across a PFO more pronounced. Thank you. When you say “more pronounced” do you mean that it’s more noticeable? Or more dangerous? In other words, if you performed an echo on a patient who has suffered a heart attack and an echo on a patient who has not suffered a heart attack, would it be easier to identify a PFO on the patient who had a heart attack? Simply means more noticeable, certainly not more dangerous. Are aspirin and Coumadin both equally effective medications for helping to prevent strokes in patients with a PFO? Is it possible for a PFO that was surgically stitched 18 years ago to reopen? I have a pfo and havent had any problems till recently. I have had problems breathing and i have had a bubble test amd the bubbles moved kinda slow going to yhe otherside. But my doctor still thinks i have severe asthma eventhough i have been expsed to severe amounts of sulfuric acid fumes. If you have a suggestion what should i do? Should i habe it fixed or no? In terms of a PFO it is very unlikely to cause shortness of breath unless there is demonstration of significant right to left shunting, typically seen in right heart failure. Asthma of course is a well described cause of shortness of breath. Unless the PFO is clearly demonstrated to be associated, in which case tests such as a shunt run need to be performed, then closure would not be advised. For someone young who has a PFO and had a stoke who is an athlete, would you still not recommend closing the PFO up? Do you think taking the blood thinners would allow one to continue daily activity? PFO is common and typically can be ignored, in some circumstances such as those having had a stroke. There is typically no reason for concern. For a simple PFO, there are in general no restrictions. The evidence has changed and i need to update this article. Hi Dr, really really good article thanks – one of the best in my extensive research. This week – Cardiologist wants my PFO closed. Level 3 at rest, Level 6 at exertion. Symptoms past 1.5 years – on and off = fogginess, pressure feeling in head, onset of anxiety, forgetfulness, fatigue, shortness of breath. Active/fit/healthy, 31 year old female. MRI showed slighter higher than expected white dots, Popliteal vein compression diagnosed.. Clots from legs through heart to brain. What is meant by level 3 at rest and 6 on exertion? Were there any clots diagnosed in the leg? In general PFO closure should be performed only if a clear benefit is likely or it can be implicated in complications. The levels were the results of the bubble study so 6 being highest amount, mine was 3 at rest and 6 at exertion for amount of blood getting through my PFO. So this would appear to be more a leg issue ?? AND a really big thanks for your post, info and how you interact with us PFO public 🙂 Thanks very much! I am a 17yr flight attendant. I was recently diagnosed with PFO after complaining of shortness of breath. A resting echocardiogram was performed. My question is because of my job as a flight attendant, would you recommend closure of the PFO because of the increased risk of blood clots while flying. Working as a flight attendant is not an indication for PFO closure. Was a lot of flow detected across the PFO? Can a PFO cause micro clots in the hands and feet? Are those micro clots life threatening? Can a PFO throw micro clots onto your hands and feet? Are they dangerous? Can they be stopped with medication? Sorry for the second request. Can you suggest what might cause micro clots on the hands and feet? Can micro clots cause a stroke? I have been having micro slots show up on a daily basis on my hands and feet. Can you describe what exactly you mean by micro clots. Last year my PFO was discovered, and my cardiologist recommended that I stop taking a pill contraceptive because it could cause blood clotting, leading to a stroke. I wanted to start a birth control plan again, and was looking into either a progestin IUD or a copper IUD. Do you think either of these options are safe enough to use? Hi Ann, if we go strictly by current guideline recommendations, in your case there would not be an indication for closure as there is no evidence it would have any significant impact. Thank you for your reply. One question I have is …why not closure? I understand you are emphasizing “according to current guidelines”, however, do you personally consider this surgery risky or difficult? It seems the risks of future occurrence may out weigh the risk of not closing a PFO? Or what am I missing? The guidelines are frustrating for that reason however they are there because in the past far too many PFO’s were closed for ambiguous reason. In experienced hands the reality is the risk of the procedure is minimal but not zero. The problem is, that although it makes sense to close the hole in recurrent strokes the data does not strongly back that contention and thus we cant widely recommend it. I have that conversation with patients with recurrent stroke, despite blood thinning medicine, prior to closing the PFO and only proceed if they fully understand the data. I also involve a neurologist in all cases i do. Hi! 44 year old female. Migraines with aura since I was 18. No recognizable pattern with them. Had a stroke of no known cause last June. Found pfo then. At that time, it was basically swept under the rug. Saw a neurologist and cardiologist at the Mayo Clinic in Minnesota for a second opinion. There, the neurologist said it was up to me on whether to close and the cardiologist was adamant that it be closed. Had another stroke months ago. Now I’m on topamax to “prevent” migraines and the side effects are making me miserable. I’ve read so many people say their migraines with aura disappear after closure. Are they wrong? There is a lot of differing opinion regarding the indications for closure of PFO and i think there will always be people with differing opinions. If however you have had repeat strokes, despite being on blood thinner the case may be a little stronger to close the PFO as long as you understand it isn’t necessarily guideline recommended and also that there is no guarantee it will prevent future events. Its one of those situations where an extensive discussion needs to take place between you and the closing cardiologist. I have had migraines with aura for years, and dizziness. two years ago i had a heart attack due to blood clot getting through pfo. I am now dealing with blood pressure issues and shortness of breath. Doctor doesn’t see the need to close it. I do. Can I request a closure even if he doesn’t or the guidelines don’t indicate. I have a strong feeling that all my issues relate to it. Its unfortunately one of those areas where the lines are blurred, however evidence is accumulating that may make it less so over the next few years. If i was considering closure in such a circumstance it would be important to have the neurologist and closing cardiologist both on the same page. Migraines for 5 years,started during pregnancy. Continual 24×7 varying degrees of pain. Nothing not even morphine relieve this pain. Every tablet and treatment known to man tried and failed. Could this be PFO? Echo clear, now going for bubble test. 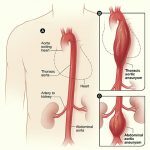 I am a very active 31 year old male who was recently in the ER for “stroke like” symptoms. Upon discharge the next day, the doctor, neurologist, and cardiologist could not say if I had a TIA, or simply an electrolyte crash (my potassium was below minimum levels) or even just a migraine. During my test they found a PFO and the doctor was already suggesting I plug it. I’m hesitant with the risks when they cannot say for sure if I actually had a stroke. CT, MRI all came back clean. I am curious if the evidence would lean towards me staying on aspirin as a precaution rather than going for surgery. Evidence would argue against closure at this time, particularly in the absence of a diagnosis. I was just diagnosed with PFO. I have had no symptoms except for a blood clot due to travel last Spring. My doctor said mine is larger than usual and suggested to do something about it. Dr. does not think that staying on blood thinner for the rest of my life is a good option because I am still young. He proposed to close it. I don’t like the idea of the device and lean more towards a surgery to close it. What are the possible risks of surgery? Thank you. As you can see by the articles and comments the need for closure is a much debated subject. If closure is advised, device closure is the standard of care, not surgical closure. Discuss the indications at length with your provider and understand the evidence for and against. First of all, thank you for the article, it was very informative! I was recently diagnosed with PFO, but have had no related symptoms. It was discovered during an Echo, after I had an abnormal EKG. Do you recommend all patients with known PFO to take a low dose aspirin daily? In the absence of symptoms there is no recommendation to take aspirin daily as things stand unless there is another reason to be taking aspirin. Hello I’m diagnosed with pfo age 27. Cholesterol 200.even though i eat normal diet. Do i have to take blood thinners. I can feel pressure in the chest. And pain in my left side ribs with shortness of breath. I discovered in February of 2016, that I had a PFO. I had a stroke on November 23, 2016. The day after my stroke, the Neurologist told me that my PFO was small and that PFO Closure isn’t performed anymore. He told me to take aspirin and eat oatmeal everyday. After being being discharged , I saw my Cardiologist and he felt that I should start taking Eloquis and get a TEE performed. He said that at the age of 44, I was to young to be having strokes and PFO Closure should be considered and that I shouldn’t be on Eloquis for a long period of time, due to its risk factors. During that time, the Cardiologist, Neurologists or any of the other treating physicians but one felt that it was due to the PFO and and brain infarcture. I went back to the Neurologist and he said that Sleep Apnea caused my stroke, but he didn’t document it. He also said that I should stay on the Eloquis, see him in three months and if I have another stroke, then, I should have PFO Closure. I’m so confused. Im confused too by listening to your story! As stated in the article the lines are not exactly clear and opinion is divided regarding PFO closure and cryptogenic stroke. Cryptogenic stroke means no clear underlying cause after an extensive work up. Current guidelines don’t support routine closure after cryptogenic stroke however there are many that disagree. The main thing is to have an at length discussion with your physicians and understand that the lines are blurred regarding the evidence. If you proceed with closure then understand that although there may be some rationale, that the evidence doesn’t necessarily support a strong benefit from closure. I read that right to left shunt pfos carry more side effects than left to right. Their is also a greater risk for blood clot and stroke. Is this true? Shunting across a PFO is variable. In general anything that acutely increase the pressure on the right side can lead to right to left shunting. The reason that right to left shunting becomes an issue is that things can potentially travel from the right side (clot etc) and go over to the left through the PFO tunnel where they can travel to the systemic circulation and out to the brain or elsewhere. Hi Doctor, thank you for taking the time on this issue. I had stroke and a PFO with no known cause. No closure still recommended at this time. But wanted to know standard of care on Aspirin for dosing if a PFO and prior stroke. My Doctor has me on 81mg a day, which I take at night. But I hear some doctors say 2 a day is better. Any thoughts if the one is enough, or would it be better to do 2 a day. I have had some Doctor different points of view. Thank you. There is no good data to answer that question, some prescribe a 325mg a day and others 81mg. Did you have monitoring to rule out atrial fibrillation and also did you have scans to rule out venous thromboembolism? Great article! I was researching PFOs due to my stroke (TIA) 4 months ago after arriving in Colorado Springs, CO to work @ 7.6K altitude. I’m 58 years old and I have had a very active lifestyle since age 16. A week prior to my stroke, while in Austin, TX, I experienced symptoms of numbness in my arm while walking (exercising) and saw a Cardiologist. Extensive tests were performed & a PFO was discovered; yet, no clear cause was determined for my stroke. The Dr. mentioned PFO closure and I wanted more information. I was referred to another cardiologist who performs the procedures. I consulted with the 2nd cardiologist and he explained the procedure and provided a website for additional research. At this time, I also researched my family history and learned that two of my elderly siblings have PFOs and were diagnosed some 15-18+ yrs ago. To date each have had 3 strokes in their lifetime. My question: Based on my family’s history of PFOs, it appears that the probability of my having another stroke is high. Would you recommend a PFO closure? The controversy that exists is amazing. The guidelines recommend that in your case anti platelet medication would be advised. Atrial fibrillation needs to be ruled out by means of a monitor, even if extended. The evidence doesn’t support PFO closure in this setting. What is particularly annoying however is that the evidence essentially ties our hands in this setting even if we want to consider closure. In your case i would rule out familial clotting disorders and such also. If your PFO is closed then do understand that the evidence does not show a benefit necessarily. The stakes are high however, stroke can be devastating, and if based on your story and interaction your physician feels it is an option, then he should have an at length discussion of the risks, proposed benefits, rationale, and summarize the evidence available prior to proceeding so that you are comfortable to proceed in an informed fashion. Thank you for posting this detailed information on PFO. Could you please tell me if PFO can be a contributing factor to TGA? Also, can you hear a heart murmur if the foramen ovale is not closed? Im going to assume by TGA you are referring to transient global amnesia and not transposition of the great arteries. Interestingly there has been some research to suggest that there may be an increased incidence of PFO in patients with transient global amnesia but there is no conclusive causal association. If my patient presents with this a neurologist involvement would be key, i would be interested to see if the symptoms occurred with a valsalva maneuver and i feel there may be a roll for transcranial doppler for academic purposes and to potentially prove an association. As things stand in general there is no evidence of routine benefit of closure in this setting. PFO is not typically associated with a murmur. Thank you so much for your reply Dr. Ahmed. Are babies newly diagnosed with a PFO safe to have Hyperbaric Oxygen Therapy? I would also like to know this!! Hi doctor my daughter was just diagnosed with a PFO and she suffers from secere migraines daily nonstop and nothing takes them away, would a closure of the PFO take the migraines away? The evidence would suggest PFO closure isn’t effective in curing migraines. Kathleen, I suffered migraines with aura for years then had pfo plugged (due to stroke) and it definitely stopped the migraines. Not 1 in 10 years since. Before the pfo got repaired, I averaged likely 3/ month with aura. So, there is a testament at least and personal evidence that it definitely is effective at curing migraines. Please doctor Ahmed , my little baby girl is one month old and in her echo report the doctor wrote that comments .. flappy fossa ovalis , with 2 fenestrations 0.4 cm each LT-RT … and in the conclusion .. stretched PFO … what does that mean i am so scared and can’t stop crying … Is my baby ok ? Please tell me if it is normal and no problem about this case pleeeease . I will ask a pediatric specialist to comment. Why was the echo performed? There was no need for echo because when my baby born the doctor check her as a new born baby and said she is healthy thank god but my baby have some flu and i went to another doctor but it seems not good doctor because she tell me to do echo because she thought that my baby’s heart beat is fast but that was wrong she breath well thank god but because i scared we decided to do echo for check up and the doctor said her heart is healthy with no problems only PFO and this will close during infancy . There was no need to do echo thank god but we do it and found every thing is great thank god only PFO but because she is only one month old baby , the PFO will close but take time ان شاء الله . Hi I’m a 38 y/o female suffering from a month long excruciating headache, shortness of breath, extreme lethargy, and dizziness, and hypertensive (only for the last month). Always had history of headaches, but never any of the other symptoms. MRI, MRA, EEG of brain all normal. Neurologist put me on topamax. Went to ER with tightness in chest a few days ago- EKG showed Right bundle branch block and tachycardia. Echo showed PFO and evidence of intra-atrial septal aneurysm. Dr recommended baby aspirin. Do you agree? Do you think the PFO should be closed? The evidence would not suggest that PFO closure would help. Aspirin may be reasonable although there is no evidence for that in this setting either. Jenna, the evidence DOES suggest that there is a 15 fold increase of the likelihood of a stroke when the pfo is also associated with an ASA (atrial septal aneurysm…floppy septum) as compared to just a pfo alone. Matter of fact, when an ASA is discovered 50% of the time there is also a pfo. Whether or not that is what is causing your headache problems is unknown and it may be something else. Google it and you will see many respected papers suggest this. Please provide a citation for the 15 fold increase, it is not accurate and is very misleading. My son was diagnosed with failure to thrive as an infant. He was diagnosed with a PFO. The dr told us it would eventually close over and that his failure to thrive would eventually work itself out. Then he’d turn blue with minimal effort with activities. We were told it was the PFO. To watch and wait. We did what they said. Then in grade seven he turned blue while playing soccer with extreme fatigue as well. We saw the dr again. He said to keep him away from aggressive sports. So no soccor, no hockey, no basketball. So we put him in passive sports instead. In grade 8 he passed out in gym class running in a game. The tests showed his left side of his heart more thick than his right side. LVH they called it. Nothing was done still. We don’t close these like we used to we were told. Well last week my son now age 16 went on a class trip to ski and he blacked out on the bunny hill. This caused him to fall dangerously and hurt his arm and his wrist. He was rushed to the hospital by ambulance. The paramedics said he had dangerously low oxegen levels when they got there and extreme disorientation and excessive sweating. His blood pressure was all indicative of heart over compensation. They brought him to the hospital and I met with Drs and he sees a specialist next week. I think my son deserves to live a normal active life without this PFO getting in the way of that. The fact that he blacked out on a small slope is very disconcerting. He could have been more seriously hurt. The out of breath and exhaustion and blacking out has to stop. When will the Drs take quality of life seriously and start repairing these PFOs? This is my son, my most precious gift of all. More important than any amount of money or anything else. Sincerely a concerned mom in Canada. With these symptoms further testing should be performed, one of these tests would be a right heart catheterization with a shunt run to see the degree of blood mixing and the potential contribution of this to the symptoms. If there is significant shunting associated with symptoms then a PFO/ASD closure may be more reasonable. Hi. Im 38 years female. In april last year, i went to shanghai from high altitude country and after flight i was elevated very fast to the Oriental tower of shanghai. In the elevator i closed my ear by finger. When elevator door was open, i had dizziness and nausea. I was back in elevator to go down. But i was getting worse feeling dizzines vomit numbness. Shortness of breath, cold, heart palpitation and like fainting. Was very afraid of dyeing. I went to hospital dr said my bp was 140/80 and heart rate 80. Dr gave a medicine to sleep well. since that day i have suffered from these symptoms for one year almost every day. I have gone to many hospitals and had many drugs. In january this year i was diagnosed with pfo of 0.33 mm. Drs said it has no considerable cause of the symptoms i have and it is not advised to close such small size. They said you have anxiety, vegetative dystonia. I am very stressful of not recovering after many efforts taking drug, injection and traditional methods for long time. Do you think my symptoms are because of pfo. Thank you for time. Persistent and continuous atypical symptoms such as these are not likely related to a PFO according to current understanding. There is not good evidence to close the PFO in such settings. Dear Dr. Thank you for your prompt reply. I have 3 children. I had no problems during these years. After going up to the tower, i have these symptoms thay have not appeared till now. Hello Dr, I just had a TEE test, the doc told my brother I have a sizeable hole in my heart and I have to come back for a angiogram to see if he can close it. I have been experienceing ectopic beats and or palpitations as well as a little shortness of breath. Is he right to want to close the hole? Sounds like an ASD. https://myheart.net/articles/atrial-septal-defects/. See if that helps and let me know if any questions. Oh I’m 40 years old and male as well as now taking a baby aspirin a day. Thank you. Hello Dr. Ahmed. We just had our first baby girl 3/18/17. She did not pass her “heart test” while in the hospital after my c section and they say she has a PFO. They said her oxygen level would decrease at some points of the test. She was born at 39 weeks. What are the chances that IT will close? I’ve been in tears every night just praying it’s healed and closed. I’m a new mommy and this was the last thing I expected. Hi Vanessa, we will have our pediatric cardiologist comment shortly. Had a stroke after traveling to California had to Change planes was a long trip. Taken to hospital soon after arrival to hotel. Was told I had a stroke on right side of my brain. After returning home have been to a neurologist who recommended a cardiologist. Have had a Tee and a loop recorder insert. Cardiologists now said I need a PFO closure. Everything else checks out. I am 75 yr old female. Latest MRI indicates have had several small strokes also. My father has had several strokes with the last one resulting in life-changing consequences. He was finally diagnosed with a PFO. His first stroke occurred 7 years ago with no known cause. Two questions: If the causes of his first stroke were unknown, is there any reason as to why the medical team did not investigate the possibility of a PFO? Since he does have a PFO, should I investigate the possibility of having a PFO? I am actually scheduled for a echocardiogram to confirm the existence or absence of a PFO. If I do have a PFO, should it be closed? I have no heart problems. Thanks. Domenic, there is no reason why they shouldn’t have checked for a pfo especially if no other causes were found. Matter of fact, in many (not all but many) cryptogenic strokes (stroke with no known cause) they often find out the patient has a pfo. In Canada at least, it is something they check for if nothing else shows up. Mind you 25% of the population has a pfo though. Some are benign and some may cause problems especially if associated with an ASA or are really big with a right to left shunt. Most of the time they are benign otherwise you would see way more strokes given the percentage of the population that has one. So, you can get tested for a pfo just realize there is a 1 in 4 chance you will have one. Sorry about your dad. I am wondering what you think of the Heartstitch procedure, is it safer than using a device? Does it leave anything in your body like the device closure. I don’t feel there is enough date or experience with the device to recommend it at this stage. I personally do not use it at this stage. Firstly a broad work up needs to be performed to rule out TIA causes, a neurologist work up included, rule out arrhythmia such as AF, carotid and other vascular disease etc. Only if these have been ruled out and you are felt to have a PFO with high risk features should it be considered for closure evaluation. I’m a 52 yr. old female who’s been diagnosed with PFO, Hypoxemia, Peripheral Neuropathy, and an abnormal EEG due to intermittent paroxysmal, diffuse focal slowing and poorly sustained background activity. I’m scheduled for PFO closure. I’ve been on oxygen for 6 months now, and have noticed no change in my mental status (memory lapses, “coma-like” states, episodes of confusion, imbalance, fatigue, and blackouts) nor in my pain. The Cardiologists have confirmed “brain damage” as being inevitable. The neurologist wants me to be seen by a Neuropsychologist. What would be your outlook on the brain damage-oxygen deprivation link, caused by a PFO? Im not sure how the cardiologists determined brain damage was inevitable? What was the explanation. If the PFO is to be closed in this setting it should be to prevent desaturation and hypoxia. I just found your twitter page. Great videos and pictures. Thank you for sharing. Wanted to get your thoughts on PFO. I suffered stroke in 2014 was 48 yrs old at time. No cause found. Small PFO, so theory two clot passed through hole hit the brain. On 2 Aspirin a day. No recommendation to close at this time. Do worry about my valves because of it since like a pin cushion with a tiny hole in it with some leakage. Always like hearing others thoughts on this controversial topic. Thank you. On my report it said I had a mobile interatrial septum probably indicating a P.F.O. . I may have heard. T.I A symptoms but was not tested for one immediately after so the cardiologist said it may or may not have been.one. . Do I need to ne concerned that I have a mobile interatrial septum or is this a common occurrence with P.F.O. I also am prone to palpitations and dizzy episodes. Thank you. The first step here is to clarify the presence of absence of TIA symptoms and i would recommend consulting a neurologist. A mobile inter-atrial septum does not signify a PFO, the first step may be a echo with bubble study. 16 year old child contemplating splenectomy to alleviate anemia from spherocytosis, but has two audible small PFO/ASDs. Have heard splenectomy increases clot risk, but unable to assess how much. We are reluctant to do the splenectomy without at least ensuring she is a candidate for ASD/PFO closure. We have heard it can be difficult to assess for sure whether you are a good candidate unless you get a catheter procedure through the groin. We don’t want to do the splenectomy then have her get hit with a debilitating series of small strokes because her PFO/ASD holes cannot be closed. But are ok with doing splenectomy if we are sure she is a strong candidate for closure. Then if she gets a stroke, we can close up the ASD/PFO. Are we way off base? In general closing the pfo prior to procedures isnt indicated unless specific concern is raised or high risk history. If even needed in the future the procedure itself is relatively simple in experienced hands and should not be a technical issue. I had my pfo closed and the procedure was not pain free. I felt a lot of pressure in my chest upon awakening. The entry spot in my thigh began bleeding badly hours later, requiring the nurse to apply heavy pressure which was very painful. I was also released from the hospital the same day, about 12 hours after the procedure. Is any of this normal? I haven’t had any problems since. No thats not normal, there shouldn’t be chest pain or pressure. Bleeding from the groin site isn’t common but is possible and shouldn’t be a significant issue. It differs between operators however i typically keep patients overnight. Many thanks for ur helpful article and ur replies to readers’ question that helped to simplify alot of things. Im 31 weeks pregnant and bcuz of my type 1 diabetes (had it for 12 yrs) im considered high risk and just had a fetal echo done. In the echo report there was mention of “patent forman ovale right to left shunting” the rest was all reported as normal. What i dont understand is if this is something normal or is it considered a defect?? It is a defect but very common (1 in every 4 people) and is often of no significance. my son 13 month please check report …. No obvious major issue on this report. Did you discuss with the ordering physician. be making blood clots. I’m 68 and never had a problem with my PFO before. Thank you. The work up would include seeing a hematologist and a cardiologist. If the clots in the lungs have originated from the legs and the kidney clot is in an artery and there is a PFO it is reasonable for an association to be expected. I recently had an echo and it showed a whole in the upper part of my heart and the right side of my heart is really enlarged. I cant get in to see a cardiologist until the 12th of January. I’m just really scared! Is it possible that I’ve had this since birth? I have been experiencing shortness of breath for close to 3 years now. Why would these symptoms from it just arise in the past 3 years. I was checked for Pulmonary Hypertension but my pressure was only 28 on the echo. I’m just really afraid that this hole is going to kill me. There are many reasons for right sided heart enlargement, of which a hole in the upper chambers of the heart is one. PFO and ASD are types of holes here. There is no reason to think the hole would kill you. Most are easily treatable. Its important the cause of enlargement is identified and appropriate treatment given. Dear Dr Mustafa Ahmed. I would be so grateful if you could give me some guidance. Some years ago I had an short period of strong migraine and was diagnosed with gliosis. At that time my eco didnt diagnose anything. For the last 4 months I have had palpitations, and disconfourt and some fine sharp pain the the chest, went to the doc, was diagnosed with some arritmia and PFO. For many years I have suffered form physical and mental tiredness, kind of shortness of breath. I understand in general you do not recommend the closure, but do you think these syntoms above can be related to PFO? If so, is there any kind of alternative treatment /medication to relieve the them? As things stand, in general, PFO closure isn’t indicated in this setting as there is no good evidence it will help. Its unlikely related to the PFO. Hi, our patients patient has a TOF with Pulmonary atresia and Patent foramen Ovale measuring 0.2cm-0.3cm with left to right shunting and cyanotic. I thought I should be from right to left as pressure in the right is higher, am I thinking right? If not, how? If cyanotic, the shunt should be right to left. I’ve had a TIA and a stroke and they found I have a PFO. Cardiologist suggested plugging the hole, but I’m not sure anymore. I’m on Pradaxa, my first line of defence, I’m 61. I was taking aspirin 81mg after the TIA and before the stroke. Should I be overly worried? When i am referred a patient for consideration of PFO closure its important to perform an extensive workup to rule out other causes prior to PFO closure. A neurologist should also be involved and the presence of a heart rhythm known as a fib should be ruled out. Its good that you are tolerating blood thinner. Also certain features of a PFO make them more significant than others. If you are tolerating blood thinner and have reservations about closure you should discuss these with the treating cardiologist. There is certainly no mandate to close the PFO in the absence of recurrent events and with the use of blood thinner. Thank you very much Dr. Ahmed ! Can a pfo be related to blood loss/hemoglobin issues? I am curious if a PFO would explain any of my 11-year old daughter’s symptoms. She was diagnosed with a PFO at age 5, but we were told by the cardiologist that it was nothing to worry about, but to simply never send her scuba diving. Over the years, she has been treated for asthma and suspected migraines. We (parents and doctor) have waffled on taking her off asthma meds as they seem to cause behavior issues and depression. We took her off of them completely several months ago to see how it would go, and although she seems to easily become winded, I’m not convinced it is true asthma as sometimes she recovers without use of a rescue inhaler. Do you have any insight into PFO symptoms in children? Could it be causing the windedness vs asthma? Could it be the source of her headaches? A PFO alone would not be expected to cause these symptoms, most would recommend echocardiogram to assess cardiac structure at this time if there is shortness of breath. PFO does not typically cause chest pain. With mildly dilated right ventricle and atrium, the tee would have shown if left to right shunting was the cause. We are dealing with the exact symptoms in my 10 year old son – almost daily headaches (generally complaining about loud noise), migraines (he had preventative medication from 6-8years of age), breathless vs asthma and anxiety. He has a referral to see cardiologist regarding possible PFO. Please let me know how you go trying to get help/answers. Just wanted to thank you for this article. About 3 years ago, at age 26, I had a cryptogenic stroke. The doctors then found a sizable PFO in my heart. I was referred to a neurologist and a cardiologist who both recommended closure. Prior to my stroke I was extremely healthy – I am a runner and was running 3-4 days a week and eating healthy, so the stroke was really a mystery. I had my PFO closed a couple months after my stroke. It has made A WORLD OF DIFFERENCE. My migraines have completely stopped, I no longer get dizzy at all – when I run I feel better and I don’t get lightheaded. I can run more now and I feel AMAZING. I realize there may not be the research to back up PFO closure but in my specific case it was the best thing that has ever happened to me! Good morning, I just turned 65 this past February, July 4th I had a TIA and was hospitalized for two days, had left foot drop and some tightness in my left hand. My cardiologist has run various test and did not see any issues, recently I had a bubble study Echo. This showed bubbles crossing from one side to another so I was sent for the TEE test and this confirmed a PFO. I saw Chief of cardiology at Newark Beth Israel he recommends closing the PFO. Since my event on July 4 th 2016 I have been on aspirin 81 MG, Crestor, my LDL is 80, and Benicar for blood pressure and it has been very good. I have gone for second opinion and the cardiologist recommended to stay the course with aspirin and not do a closure. I am 5ft 7 169 pounds and do not smoke, should I do this closure at my age? The Cardiologist I had gotten second opinion from says usually 65 is the cut off for the closure, I am interested in your opinion. I was diagnosed with PFO around 10 years ago and never really understood what it would mean to my future life, I was monitored every year as a kid till the age of 16. I’m now 41 years old and would like to understand if my PFO affects my blood pressure readings? I exercise 4 or 5 times a week (weights, running & cycling @ 800 active calories a day). I also keep a clean diet and weight around 80kg. I drink maybe 5 to 10 units a week and never add salt to my food. However, when I take blood pressure readings they range from 120/58 to 135/62 more often 130+. I wear an apple watch to keep an eye on my bpm which can drop as low as 42 at night. I never have any problems during HIIT training or any shortness of breath at any point. I’ve tracked my C02Max which is around 58. I’d like to understand why the number can hit 135 when I lead such a health life style? could this be the PFO? There is a history of stroke in my family (grand father & mother) and want to be mindful. A PFO is likely entirely unrelated. Unless the PFO is remarkably large its unlikely to have any noticeable effect on your exercise capacity. In general for PFO there are no specific activity recommendations. Is it dangerous to scuba dive w/ a PFO? My boyfriend recently started having “heart palpitations” . He is 28 yo drinks coffee and smokes. the palpitations were intermittent and would last hours when they did start. No specific activity brought them on and nothing seemed to relieve the symptoms. He really would notice them most often at home when he was just sitting on the couch. He went to PCP, in office EKG normal sinus. Palpitations continued with occasional occurrences of chest tightness. Follow up cardiology halter monitor and echo were scheduled. While waiting for the results he continued to experience palpitation episodes with occasional dizziness, tachycardia, SOB, and was diaphoretic. They stated his Halter reading was normal sinus. While wearing the halter he had a recordable event so I asked the doctor to look again. When asked to look again doctor stated there was a “double beat”, but never stated the rhythm. The echo detected an atrial septal aneurysm, and bubble echo confirmed a PFO. He said there were like 3-4 bubbles noted in passing atrium but never gave us a specific measurement of the pfo size. Casually before leaving he stated he could take an baby Aspirin daily, but didn’t explain why, for how long, or if it was necessary. I have noted at night by boyfriend has periods of apnea, and his mom has a CAD. My question is is surgery necessary? Is aspirin warranted in this case because he is symptomatic? I’m nervous I should seek a second opinion. The evidence has changed to where it is reasonable in some candidates to close the PFO if truly cryptogenic. I will update the page soon. Hi Dr. Great article as I came to understand PFO and ASD. My son is recently diagnosed with ASD 11mm after we got a third ped cardiologist echo test. The first two result only indicated “small PFO”. After birth, doctor found his Sp02 was low but after monitoring for 2 days he was discharged with pennicilin. He was re-admitted after 2 days due to fast breathing > 60 breaths/min. And X Ray shows glass-like lung with enlarged RA/RV. That prompted us to visit two ped cardio which found a small PDA and PFO. Since discharged from pneumonia case (after given another antibiotics and furosemide), he stills breaths fast therefore after 2 weeks we saw a third ped cardiologist who found 11mm ASD. However we noticed that baby was crying when echo was conducted. My question is 1) Would crying baby affect the echo result cause enlargement of PFO? 2) What’s the possibility of enlarging PFO from “small” to an 11mm ASD within 2 weeks? 3) What action will you recommend based on above facts alone? Hi Dr. Great article as I came to understand PFO and ASD. My son is recently diagnosed with ASD 11mm after we got a third ped cardiologist echo test. The first two result only indicated “small PFO”. After birth, doctor found his Sp02 was low but after monitoring for 2 days he was discharged with pennicilin. He was re-admitted after 2 days due to fast breathing > 60 breaths/min. And X Ray shows glass-like with enlarged RA/RV. That prompted us to visit two ped cardio which found a small PDA and PFO. Since discharged from pneumonia case (after given another antibiotics and furosemide), he stills breaths fast therefore after 2 weeks we saw a third ped cardiologist who found 11mm ASD. However we noticed that baby was crying when echo was conducted. My question is 1) Would crying baby affect the echo result cause enlargement of PFO? 2) What’s the possibility of enlarging PFO from “small” to an 11mm ASD within 2 weeks? 3) What will you recommend based on above facts alone? I’ll see if i can get Dr Law our pediatric cardiology specialist to chime in.